Every business owner has their own profitability goals and their own metrics to measure success. While it’s important to monitor the health of your business through internal benchmarking— comparing current progress to past performance— that data doesn’t tell the whole story. To have a complete picture of how well your business is performing, you need to have a solid external benchmarking process in place. External benchmarking allows you to see how your numbers stack up to other companies in your industry so that you can take the right steps to meet your growth goals. If you involve your banker in this process, he or she should be able to provide the necessary information (or point you toward the right resources) and help you decide which metrics you should prioritize. To learn more about how to use benchmarking in your business, download our free guide here. If you’re applying for a business loan for the first time, it may seem like there are endless obstacles standing in the way. Banks expect to see so much documentation of your company’s financial health that the whole process can quickly become overwhelming. This is another instance when a trusted and experienced banker can help point you in the right direction. When it comes to preparing a loan application, half the battle is providing all the documents your banker needs to see. But wise business owners should make an effort to have these documents handy at all times; in addition to smoothing the loan application process, organized financial data can help you make actionable decisions about how to grow your business. Your banker should be able to provide guidance to help you get (and stay) prepared to apply for a loan, preferably well before you experience a cash flow crunch. When it becomes clear that maintaining your business’s growth means making some big purchases or hiring more employees, your first instinct may be to apply for a loan. However, there are several other ways to raise capital for your business, such as a line of credit or selling equity in your company. Knowing these various options opens up possibilities for business owners, but it may also cause more confusion than clarity. A trusted banker should be able to walk you through the various capital options available to you, and help you make the right decision for your particular needs. 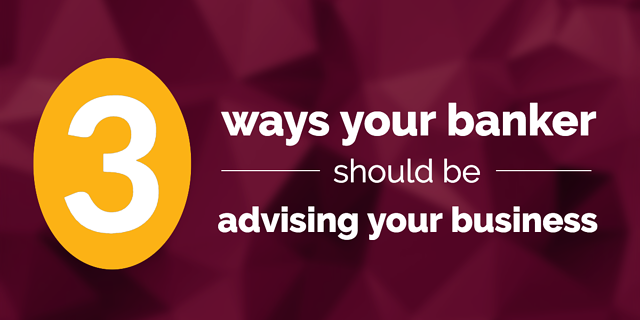 If you haven’t developed a trusting consultative relationship with your banker, you may be missing out on valuable guidance and resources that can help your business grow. At Business Bank of Texas, we’re proud of our personal approach, and we are happy to help all of our customers find the right solutions for their unique business needs. If you’re looking for a banker you can trust to give you trustworthy advice, contact us. We’d love to talk to you about how we can help you reach your goals.